Another nest of ‘scientific’ haters goes dark | Watts Up With That? ScienceBlogs was an invitation-only blog network and virtual community. It was created by Seed Media Group in 2006 to enhance the public understanding of science. As a result of the free rein given to bloggers and the incentive to increase traffic, bloggers on the network often discussed hot topics such as politics and religion in addition to science. These topics frequently incited heated arguments in the comment threads and bloggers on the network sometimes got into arguments with each other over a series of posts. And THAT was the formula for the inevitable demise, because the kind of hateful rhetoric spewing out of “ScienceBlogs” was something we knew couldn’t sustain itself…and it didn’t. It’s gone dark as of October 30th, it is now no more. On 14 October 2017, astrophysics blogger Steinn Sigurðsson publicly revealed that ScienceBlogs was due to be shut down, and David Gorski, author of the “Respectful Insolence” blog under his pseudonym Orac, stated that ScienceBlogs had “barely existed as an entity for a few years”. Astrophysics blogger Ethan Siegel reported on 22 October 2017 that ScienceBlogs had informed bloggers it “no longer had the funds to keep the site operational, and so they would be shutting down”. I decided some years back it was time to ignore him after this poll was conducted: Reader poll – should I sue the pants off Greg Laden? My decision then was to ignore him, and the decision was a good one. His blog died in the vacuum that followed. Nobody cared anymore what he had to say. Another blog at ScienceBlogs, “Deltoid”, run by Tim Lambert, met a similar fate, but much earlier on. It seems Tim crossed the line one day on a climate opinion, and smeared a respectable journalist, and that journalist decided to fight back, hard. I had some behind-the-scenes involvement in that. After that, Tim was reduced to posting monthly open threads, and that was it. Yep, his “science blog” is dead and as far as I know, nobody attended the funeral. So much for “Taking science by the throat“. Moral of this story: hate isn’t marketable. Update: I forgot all about Pharyngula by the ever grouchy PZ. Myers. November 6, 2017 in Bad science journalism. Peter Gleick was rewarded for his crimes by National Geographic’s ScienceBlog subsidiary, where he became their resident “scientist, innovator, and communicator” on global water, environment, climate, and presumably identity theft, fraud, character assassination, and forgery. Good riddance! So how come it is featured on Steven Goddard’s site, June 2011? Don’t see him much around these parts however. Thank you for having reminded the exclusive nature of some Catastrophic Anthropogenic Climate Apocalypse (CACA) conjectures. Mr Stokes, have you ever contemplated your irrelevance ? PS have you got he right Times cover this time ? If Leo G is claiming that someone at Scienceblogs fοrged this cover in 2013, then its presence on Steven Goddard’s blog in 2011 is relevant. Tony had a problem on this site with the moderator. Doesn’t come here at all. The Time magazine front cover was one of those many historic articles that Tony finds to emphasise the nefarious nature of the current global warming missives. I’ve lost track of the argument over the fake Times cover shenanigans. Is it the consensus that the one in the bottom left is fake, but the others are all authentic? I actually fell for the fake one (and published a parody of it!). However, the real cover appeared recently[2, Sep 2017] in the story about the fakes, but has now vanished[2, 7 Nov 2017]. Funny game, this! But is the news that the cover was fake itself fake, and that the cover was in fact real? This was covered in Greg Laden’s blog, but that seems to have disappeared. 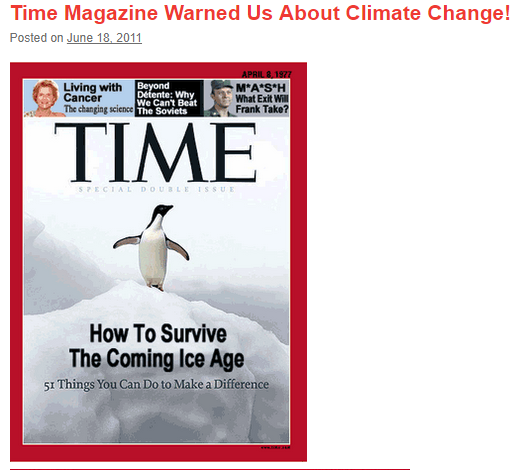 That cover may be fake, but the original Times article on “Another Ice Age?” was real. No, all the covers there are genuine. The bottom left (2007) was doctored to create the similar cover I showed above. Leo G says that was done in a 2013 post at ScienceBlogs (which actually drew attention to the alteration). But the doctored version was used many times before that, including as shown above in 2011. Hey Nick! Why don’t you put on your big boy pants and go confront Tony at his blog? Which BTW, is still up an running unlike the subject(s) of this post. Nick Stokes, I pointed it out to Tony, and he promptly fixed it. You could have done that. Completely missing the point. I’m not greatly concerned to get a particular six-year old occurrence (one of many) fixed. I raised it to show the absurdity of Leo Goldstein’s accusation that the cover was fοrged by Greg Laden’s site (with the complicity of Time) in 2013. It was in widespread circulation long before that. Fair enough, Nick, but I don’t think that error was “one of many” on Tony’s site. I suppose that depends on what you mean by “many.” He’s certainly not infallible, but he’s usually pretty careful. If you find errors on his site, perhaps you should email him, and tell him about them. (Email me for his email address, if you don’t have it.) I imagine he will be grateful (assuming you are polite). No, I meant one of many on the web. AFAIK, this is the only occurrence on his ste – it’s the only one that showed up in my web google search. So Nick has time to scan my 100,000 blog posts looking for six year old articles he can find to complain about, but doesn’t have time to respond to my recent series showing how he is wrong about temperature data? Now, let’s see how much longer SkS and the kids can go on for. But they’ve moved on to greener pastures at the Guardian. You’d think a site that is freely promoted on every single Google search with the word ‘climate’ would get more hits. It’s as sad as Hillary losing despite 90% of the media spreading pro-Hillary propaganda and rigging the debates in her favor. A time for ever gone — ah, woe is me! To love but thee alone — ah, woe is me! The days that were — that never will be more! As gathered flowers — ah, woe is me! That love of ours — ah, woe is me! As yesterday! — ah, woe is me! Pharyngula still exists, but now is more of an atheist and political than biological site, and suffers as a result. The current blog is typical, with a host of posts against religion, Trump, man-made global warming and almost anything else but biology, and a single, lone, interesting post on whole genome duplication in arachnid evolution, as shown by the house spider. And that one worthwhile post is just a video by someone else. Maybe PZ is putting more of his time and effort into his YouTube channel. Pharyngula had a climate rottweiler called A Ray in Dilbert Space, the first climate commenter I ever had any interaction with. He was a bright, articulate, profane physicist who i’d also occasionally see on Rabett Run. He’s probably still around, but he seems to have sort of faded away from climate comments. And how much damage has that piece of junk website done? Thanks for nothing. I just saw PZ Myers name the other day. He’s a pretty big supporter of Refuse Fascism. you can trust me on this…otherwise just click and scroll down. His name is right next to Carl Dix. Oh yeah, I forgot l about that. Apparently, so did the people who were supposed to attend. Yeah, ’cause we can all remember D-Day when the last group who Refused Fascism decided to have a lie-in that lasted all day. In my (UK) innocence, I assumed Refuse Fascists were a sort of rubbish (trash, refuse) fascists. Like dumb Nazis. Looking at the site, I see I was right. Albeit “Liberal Nazis”. While on the subject, I wish you Americans would stop corrupting the word liberal. The founders of liberalism – Locke, Hume, Smith etc – had much merit. Democrats (that is another word you have sacrificed) have a substantial totalitarian wing. People are much too stupid to be allowed to vote. I completely understand your comment “I wish you Americans would stop corrupting the word liberal. The founders of liberalism – Locke, Hume, Smith etc – had much merit.” however, the Progressive/Left have assumed & co-opted the nomen “Liberal”… so it is unavoidable that we who do not find ourselves aligned with that ideological mess, must use the term :Liberal” as a descriptor. I was born during the Truman Administration, and I recall JFK’s presidency, which was probably the last, classic Liberal administration we had. We folks today who would be 60s Liberals are now calling ourselves Libertarians. It is anoying, but hard to stop. The authoritarians have latched onto a different word every decade or two and twisted it in an attempt to cover themselves. Hell, even Communism and Socialism were originally meant to refer to something very different. Fascists fighting fascism. Always a fascinating spectacle. The link to Connolloy’s blog now goes to Blogspot. I used to read “Starts with a Bang” by Ethan Siegel. Not bad as long as he stuck to astrophysics. And another one bites the dust, consigned to the failed philosophy ash heaps of history, unmourned…. Maybe the future supply of taxpayer/NGO dollars is not so certain anymore for some reason? Never heard of the bozos. On a scary side note; I came across the Laden character bloviating negatively about waterfowl populations. Another of his writings not worth reading past the first few words. He seems to have abandoned sites like this where the average bloggers are too intelligent and informed to swallow the mandated rhetoric. Like most of the alarmists, they can only thrive in an environment where they can ban anyone who disagrees with them. Speaking of Connolley, the comedian James P Connolly is a hoot… check him out on youtube! I had run ins with him WAAAAYYY back in the days of Usenet. Wish I could dig up where he try to convince me (no, not really, he flamed me) that the Little Ice Age was a short, local phenomena. Don’t go away mad, just go away! Oh, and don’t let the door smack you on the backsides when you leave! On the contrary, I would love to see the door propel him to a massive face-plant into a big heap of his own putrid excremental muck !! Skeptical Science will be next – it gets about as much traffic these days as a blog about basket weaving for Englishmen living in Detroit does. Remember – where conscious goes, energy flows. Or is it “where energy flows, consciousness goes”? I forget, but it’s the reason why WUWT, Climate etc…, Jo Nova and others are so successful when it comes to discussions on climate matters – logic and common sense are attractive to the sentient individual. Propagandistic BS, not so much. Those in charge of Newsvine (NBC) were PC lefty liberal proponents of CAGW and were thus extremely selective in what commentary was permitted to be posted. The good thing about having a slowly worsening memory — Connolley, Deltoid, Laden — I had to look them up, and then I realized that I probably knew of all of them, perhaps even commented to each of them. Oh-humm. Oh how gloriously time flies and they’ve barely left a mark on posterity. They left a skid mark. Years of teaching have made me more patient and diplomatic than I would otherwise be but on many occasions I have thought, but not said out loud, words to the effect of the above quip. Still going strong, the evil gang meeting in Bonn right now and the lunatics closing down the economies of Europe at any costs. How long will it take? The great thing now with the COP is the US is still a full member for 3 more years. -the US reps to the COP should be pressing for clean coal technology (scrubbers from US manufacturers) to help developing nations get affordable electricity. – the US reps should push US fracking technology (from our proven fracking businesses) for Europe to develop its own shale gas-independence from Russia and the Mideast. COP22: US leading the way to clean Fossil fuels technology for a cleaner 21st Century. I saw a comment a few days ago on the JoNova site (probably from the hardworking”Pat”) that suggests that your idea would have some international support . It was a reference to a report from an Industry or energy minister in India calling for an international conference , forum or consortium on the latest clean coal technologies . In India they need cheap , clean energy to take 100s of millions out of poverty and coal , if its environmental impact can be controlled, is one of the best ways of accomplishing that according to this minister. Unfortunately I cannot find the comment again, but perhaps someone else noticed it. Apparently no official US delegates will be going, although I have my doubts, but an unofficial group of green martyrs are going. So satisfying to let nature just take its course. It proves you were right not to get involved in any legal bun-fights. They would have thrived off the victim status. Instead their oxygen ran out and karma turned up with a dustpan and brush. With Pruit cutting funding to government run climate change …. real climate may be the next. I haven’t been there in ages …. may have already folded. But when what you say makes no sense and is unabashed propaganda …. fit only for the handful of useful idiots in Antifa ….. your blogs days are numbered. Gavin should have been fired long ago for blogging on the public dime. Hanson himself should have been gone the first arrest for activism. And should have been fired for his antics at the 1988 hearings. Now’s the time for an investigation. Both Stoat and Greg Laden have migrated their sites. They are not dark. And how many here even know the significance of Paul Myers’ site name (since Gabro mentions it above)? I mentioned it because our host mentioned it. As a biologist, I of course know the significance of PZ’s site’s name. Poor totallygullible, We are all embarrassed for you, whenever we read your posts. I am PhD immunologist with BS in Civil Engineering and quite a bit of Masters level EE courses in signal processing. I have studied the “science” of climate science. I do not have to be a climate scientist to understand what climate science does with mathematical modeling and statistics. You do not have to be a climate scientists to read with disgust the ClimateGate emails. One does not have to be a credentialed climate scientist to see the willful hiding of uncertainty in the data or of the subjectiveness of climate model outputs. It is horrifying the ways in which Alarmist climate scientists have perverted science for a paycheck and tenure. Men like M Mann are indeed a disgrace to the profession of climate science; to all of science. Where do you count yourself? – One of the Climate Change faithful, blissfully accepting the alarmist dogma? – Or the knowing but dishonest Climate Priest class? The sites of Stoat and Laden will always be DARK, UGLY places. Srsly, I don’t care enough about them to try finding them again. Well how the mighty have fallen. I used to love PZ’s old blog, and he was propelled to fame thanks to that weird ‘documentary’ called ‘Expelled’ (which I have not seen). What happened was that he and Richard Dawkins, both of which were in the film, attended the premiere. One of the organizers went up to Myers and told him to leave, while Dawkins was completely ignored. He could have been influential, but at the end of the day, he offered nothing substantial. He did a silly stunt by crucifying a communion wafer. At the same time, to prove a point, he desecrated a book by Dawkins and a copy (in English) of the Koran (I disapprove of that because only Nazis desecrate books). But that wasn’t really that interesting, and it was just a distraction. After a while, I noticed that his followers were really annoying and I just thought, “What’s the point?”. There were other bloggers who were more interesting and more eclectic. When you go the full SJW, you eventually drift into meaninglessness. I miss the arguments at Greg Laden’s blog. There was a lengthy non-discussion of George Orwell’s “1984”. But I see that I haven’t commented there since February so apparently I don’t miss it much. I have no doubt that the Climate Change Alarmists will one day be seen as we see 17th Century Ptolemaic mathematicians today. Simply wrong. They weren’t stupid. Some were in fact mathematical geniuses. Simply their paradigm was/is wrong. And until that day when the veil of climate ignorance is lifted, real scientists must live with them. It is hard I realize. They currently infest much of academia, the science academies, editorial staffs at big name journals. They sometimes are deceitful and use non-scientific methods to further their careers and paychecks. But like Sb, truth and unavoidable climate reality (that the Earth is entering a climate optimum) will win out over the hate. And like Sb, their time will come for being flushed down the toilet of bad ideas. Not by a person. But because their ideas on CO2, on stifling dissenting, inconvenient science data and debate, as the central element of Earth’s climate will be as curiously quaint as the idea of an Earth-centric universe is to us today.. Sorry Joel. 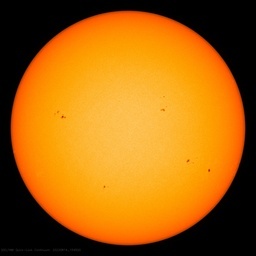 The AGW idiots are too dangerous to be that forgiving. Their behaviour is more like willful negligence and they must be held responsible for their actions. Michael Mann’s hockey stick worl for instance, was deliberate and crooked, no simple mistake, and he has had ample opportunity to disavow it and offer apologies. He has no place in science! To be fair to the 17th century Ptolemaic mathematicians, their computations were complex, but accurate. In effect, they were applying Fourier transformations on ellipses. Suggest to all WUWT commenters, any subsequent post from reallyskeptical be responded to with only “What’s your profession?” until such time as an honest answer is provided. And all are free to be really skeptical of that answer….. I stopped visiting the Guardian for the same reason. The fewer the hits, the smaller the income. But alas, no bitter complaint against wind power. Our local version of the Guardian/NYT is the Toronto Star. Last year, they stopped taking comments. I said then that, while I understood the reason, from a financial sense, its dumb. I would visit several times a day (alas) to comment. Each visit was a click, each click (maybe) a few cents. Now? I don’t click as much, if at all. Hiring someone to edit comments is a cost, that’s for sure, but when all those commenters go away, isn’t that smart of a business model, no? With the sheltering of “Teen Vogue”, and Gothamist.com, etc…I think we’re seeing the inevitable conclusion that even billionaire angel investors are tired of losing money supporting what is basically very bad writing covering even worse politics. It seems also that Donald Prothero has stopped blogging, see http://www.skepticblog.org/author/prothero/ at scepticblog, Prothero devoted an entire blog to the Texas-sized floating plastic waste in the pacific (which I doubt exists), with of course no pictures, just hearsay, he is a real rabid climate blogger, or was, I am glad he slowed down, but he was good entertainment for a while. Donald R. Prothero was Professor of Geology at Occidental College in Los Angeles, and Lecturer in Geobiology at the California Institute of Technology in Pasadena. He earned M.A., M.Phil., and Ph.D. degrees in geological sciences from Columbia University in 1982, and a B.A. in geology and biology. He is a quite competent paleontologist when he keeps away from CAGW, which unfortunately is rarely nowadays. There were good blogs on ScienceBlog at one time, e. g. “Tetrapod Zoology”, however they either moved away or died years ago. Too bad, so sad . . . where’s my violin? I’ll find you a magnifying glass. It sometimes amazes me how easily otherwise intelligent people are conned into not discussing what the “scientific establishment” wants left undiscussed . . by otherwise intelligent people. “ As a result of the free rein given to bloggers and the incentive to increase traffic, bloggers on the network often discussed hot topics such as politics and religion in addition to science. These topics frequently incited heated arguments in the comment threads and bloggers on the network sometimes got into arguments with each other over a series of posts. Sure, it’s not the hateful rhetoric spewers, but the topics . . which magically defy rational moderation . . Kinda like trucks being spoken of as responsible for much recent mass death, rather than the hateful people diving them . . I think this is (was in this particular case) actually part of an intentional “gettoizatation” effort, to prevent intelligent people from discussing things beyond a narrow range of focus, so the interconnections between various agendas/realms are not grasped or understood by them/us. I mean, seriously, if something as contentious/polarized as “climate change” can be dealt with routinely, what in the world makes anyone think some other subjects are going to cause some sort of serious problem? If someone gets hateful, warn and then boot them. Stifling/prohibiting non-hateful speech/discussion on the grounds that someone else might be provoked to hateful rhetoric by it, is just plain capitulation to hateful people, in my eyes. A victory for the controlled society freakazoids (whom I believe were the backers of the CAGW scare/vitriol all along). “Gov. Jerry Brown led a delegation of California politicians and climate change activists to Rome this weekend, where he gave a keynote address during a Vatican-sponsored conference about threats facing the environment. The governor, who once studied to become a Jesuit, urged religious leaders to mobilize their flocks to join the fight to protect the planet—and he attended an 80-minute meeting with the head of the Jesuits. I am curious about what happened with Tims pro-CAGW-blog Deltoid? Does anybody have more details? Anthony Watts said he was kind of involved? Was the journalist Peter Wood of CHE? Because Tim L went from topical posts to only monthly open threads (sometimes to be months overdue when opened) during a time when I first was mentioned/discussed (in a guest post by John Mashey in a response to Woods article in CHE) whereafter i quite quickly and by popular request was banned to ‘my own ‘Jonas-thread’) which thereafter for more than a year was the main part of any substantial discussion over at Deltoid. This being obvious through (most often) the most recent comments all being in a and old and very long 2011-post, the Jonas-thread, apparently was embarrassing to Tim Lambert, so he tried to slow the discussion down by delaying my comments for weeks in so called ‘moderation’. And that thread would still not die. So finally he closed it for comments all together. I would think that some 6000+ comments there constitutes one of the longest threads/discussions on ScienceBlogs. There’s a relevant comment by the blogger Godfrey Elfwick: “Free speech in theory sounds like a great idea, until you realise how many people use it to say the wrong things”.